This week’s Utah Viola Society guest is Alan de Veritch himself! 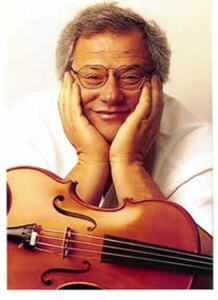 Mr. de Veritch is one of the world’s most respected violists and teachers. He has been a soloist, a chamber musician, a principal player in the LAPhil and New York Philharmonic, a Los Angeles studio musician, a teacher, a conductor, and that’s just his musical career! He has also had very successful careers in real estate, business, and has been a flight instructor for both commercial and private pilots. Come meet Alan de Veritch this Saturday, have him autograph your copy of his recently released autobiography, “Malibu Man,” and view his amazing collection of memorabilia at the Primrose International Viola Archive. Attend the masterclass with James Dunham, Paul Neubauer, and Nokuthula Ngwenyama, and stay for the Panel Discussion with Alan. Don’t forget the excellent recital on Friday evening, and bring your viola for a viola choir performance of Alan’s arrangement of the Brahms songs! All events are at BYU, and are free and open to the public! Click here for a schedule of the events! Mr. de Veritch joined the faculty of Indiana University in 1994, where I was a student at the time, and I was fortunate to take what I believe was his first Orchestral Repertoire class at IU. I have two distinct memories from that class. The first was being puzzled about how much time we spent on Tchaikovsky’s 1812 Overture. I couldn’t understand why we worked on it every week even though it isn’t asked for on professional orchestra auditions. I wanted to spend time learning all the tricks to playing a great Don Juan! I recall Mr. de Veritch saying that we would all thank him later when we found ourselves with jobs or freelancing and would be performing it on one rehearsal. Fast forward several years to when I found myself sitting in rehearsal, with about 15 minutes left for rehearsing 1812, and Alan’s words came back to me. It dawned on me that indeed, Alan was right! Thank you, Alan! My favorite memory was the moment when Alan demonstrated Berlioz’s Harold in Italy in rep class. It was jaw-dropping, stunningly beautiful playing, and I’m certain that I’ve never heard a Harold so lovely since then. Alan On Utah: “You know, I have quite a deep connection to Utah that goes way back. I had the good fortune of knowing and working with Maestro Abravanel since my earliest days as a teenager back in California. Additionally, it was Maestro Abravanel who offered my sister and her husband their very first professional orchestra jobs in the 60s. Consequently, for a number of years, my sister Nina de Veritch Smith was Principal cello and her husband, H. Dennis Smith, was Principal Trombone of the Utah Symphony. In fact, [former Principal Trombone of the Utah Symphony] Larry Zalkind studied with Dennis Smith for quite some time and even performed at his funeral service. My wife, Evelyn, and I always enjoy our time in Utah, and have the highest regard for BYU, PIVA, David Dalton, Claudine Bigelow, David Day, and Myrna Layton. Everyone here has been absolutely wonderful to work with and their handling of my collection has been superb. On working with a young Paul Neubauer: “By the time Paul and I first began our work together he had received some initial instrumental training and was beginning to exhibit signs of true musical talent…I was quite taken with him as a talented and precocious pre-teen…As I had predicted, accomplishing our goals did indeed require a great deal of work and perseverance on both our parts but ultimately the process proved to be an incredible learning experience for me and one of the most rewarding opportunities and journeys of my life. On pedagogy: ““The System” that Thula refers to [in her UVS guest blogger post] is one of the most valuable things I truly believe I have done. It derived from a series I created called “Learn the Viola in a Day…8 hours, that is. No joke!” I can basically present the major elements of this program in eight 1-hour modules. In these eight hours, I can cover just about everything I think there is to know about playing the viola. It doesn’t mean that people that have completed the eight hours are masters of the instrument, but it means they’ve gone through an organized method and can quite logically understand how it’s done. I arrived at this pedagogical approach as a result of teaching so many other fields of study other than music: flying, corporate, real estate, law, business, etc. In music, every teacher has their own way, usually made up of a compilation of all of their teacher’s methodologies. How you would apply your teacher’s information for the rest of your life could ultimately be quite fragmented. It seemed like the music world needed an actual curriculum for teaching instrumental performance. The most common problem I’ve observed throughout my years in the world of music performance is people making things way too complicated. One of the major premises of my “System” is learning to teach everything one needs to know in a simple, straightforward manner. When I began my studies as a violist, there were literally no young people who really wanted to play the viola. However as time progressed, interest in the viola began to boom. Sadly, it quickly became obvious that there were not enough truly proficient teachers to keep up with the growing interest. Part of my “System” was therefore designed to help develop qualified young teachers to teach pre-college violists. The System actually evolved into becoming the basis for the first seven or eight lessons of every student I ever taught. It was amazingly effective; by the end of the first semester, the student knew their basics extremely well, and as we moved into more difficult repertoire I could refer back to a specific lesson in the System which quickly facilitated their ability to eliminate the difficulties they were experiencing. The first seven hours are playing fundamentals, and the eighth hour is essentially what became “The Art of Sensuality and its Impact on Great String Playing.” The first seven hours are how to play the viola; the eighth hour is WHY you’re playing the viola. Performing repertoire should be similar to reading a finished novel; the grammar and spelling are the basic fundamentals. On his collection in the Primrose Archive: “The collection is “living,” and will be added to as time goes on. My collection has a wide variety, and at different points of my life I’ll release additional items as they become appropriate. The last category will most likely include the majority of my edited repertoire. For now, their inclusion will have to be delayed due to my current use! When spending time working on my collection at the PIVA, the supervisors tell me, “It’s so cool to have you here. Most of our donors are dead!” I have to laugh, but in reality my collection really is somewhat different from other donated archives, due to my rather unique ability to personally participate in it’s development. We’ve been able to organize it together. One amazing thing BYU has done is take my reel to reel recordings and convert them to a digital format, going back as far as when I was 10 years old. They’ve taken 20 or so recordings, ranging from solo recitals, to chamber music performances, and put them on a listening station in the music library as part of the exhibit. These recordings include solo recitals, solos with orchestra, including a performance of mine with the Philadelphia Orchestra, and numerous chamber music performances with my own quartet, the Aldanya Quartet, and with such colleagues as Itzhak Perlman, Pinchas Zukerman Sergiu Luca, Young Uck Kim, etc. while still all teenagers. My grandfather’s Graduation Diploma from the Prague Conservatory on 1903 which contains all the original signatures of most of his personal professors as well as one of the last professional original signatures of Dvorak, who not only happened to be Director of the Conservatory at the time, but was also my grandfather’s composition professor. Many photographs from my career as well as an amazing collection of photos bearing personalized greetings to my father from many of the most notable performing artists of the 1940’s. This collection includes photos of such artists as Horowitz, Rachmaninoff, Piatigorsky, Heifetz, and even the catalyst of Primrose’s career, Richard Crooks. 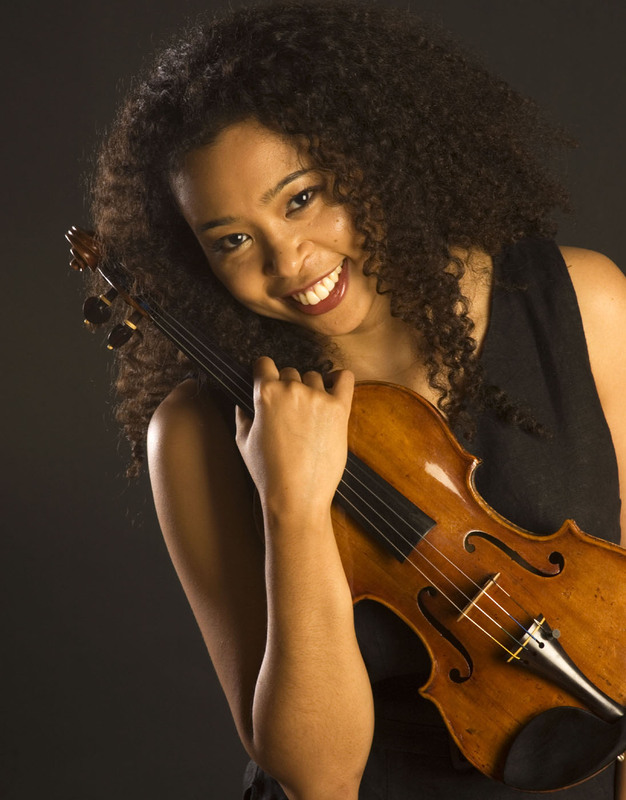 This week’s Utah Viola Society guest blogger is violist and composer Nokuthula Nwgenyama. Not only is she one of the viola superstars of next weekend’s Alan de Veritch Tribute/Primrose Memorial Concert, but she will also be presenting a Utah Viola Society Masterclass on September 21 at 6pm in Dumke Recital Hall at the University of Utah. See you there! I worked with him through the Colburn Community School for the Performing Arts in Los Angeles, CA. Lessons would either be in South Central at the annex or at his home in Valencia, CA. Sometimes we’d have a lesson in Port Hueneme, which was always a nice drive up the coast and through the strawberry fields. The structure of my lessons with Alan depended on what was coming up. Initially it was training, so we focused on a lot of technique and less on repertoire work. As the technique solidified and I was able to manage it without as much supervision, we began worked on building the repertoire. Tasks set for the week were expected to be accomplished. It’s not that Alan was strict, but we both knew we had work to do and did it. My lessons with Alan were long, 2-3 hours at times. If I was working on a piece it was generally practiced and ready. There was a lot of playing in my lessons. Exercises were prepared and scrutinized; phrases were equally scrutinized. The goal was always to be a more relaxed player, a better musician, a clearer performer, to continue to grow and build, to not let the little things slide, and to be ready for the next opportunity, whatever it might be, a la Walk on the Northside. His fingerings are the perfect combination of expression and function with inside Primrose-isms! Alan had the ability to effectively analyze Primrose’s flair, from shifting, to vibrato, to bow contact, to living in the upper third of the bow. He shared his observations freely and with such loving humor. It’s a fun and deeply meaningful legacy to be a part of. The Walton fingerings and bowings are the best and only, they are true war horses! And Alan’s story behind them are priceless. I rely upon ‘the system’ with a few additions to maintain the machinery. Schradieck, Flesch scales, especially the scales on one string, are great ways to center the playing. Everything is built on basics, and those he gave me remain a huge part of playing and teaching life. “Lead with the wrist,” “pinky flexibility,” “flat hair on the down bows,” “weight in the string,” “bow division,” “contact point,” and “breathe” forever! What I admire about Alan’s teaching is its logic, intelligence, and his directness. It’s all about the basics! We have a teacher-student bond that’s like family. It’s been like that from the beginning, and that is very Alan. Training and preparing for the Primrose Competition is a particular highlight of our relationship, and a testament to his nurturing and intelligence. He was a complete teacher and mentor, in the sense that he thought about the cultivation of the entire person, not simply the approach to the instrument. The great teachers are like that. No discussion about it was really had until witnessing the 1991 Primrose Competition, which he brought me to with his lovely wife Evie. Afterwards he asked if I thought I could be ready for 1993. When I replied yes, the preparation program flashed in his eyes, and in that moment I knew there was work to do! We’ve gotten to share some profound musical and professional experiences. 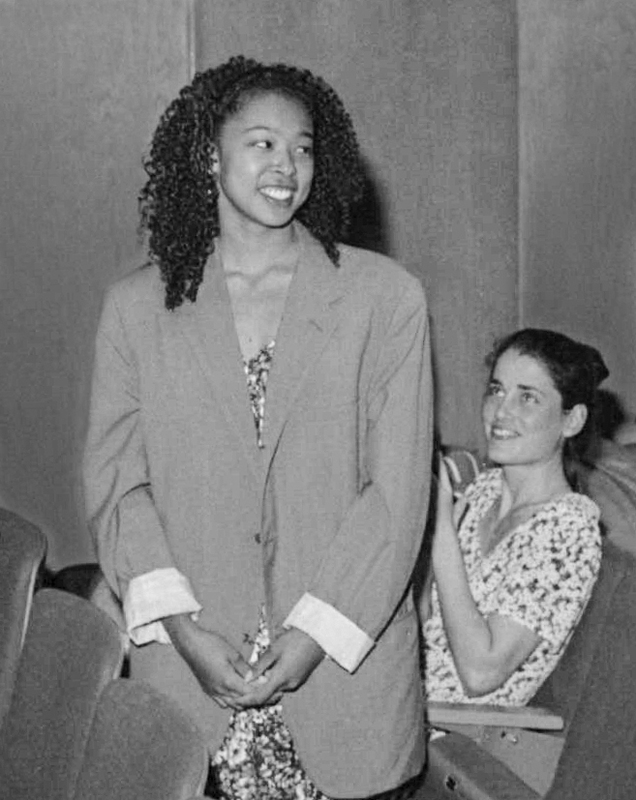 Thula in 1993 after winning the Primrose Competition. Kathryn Lockwood, the Second Prize winner, looks on. Photo courtesty of Dwight Pounds. I look forward to seeing Alan and sharing stories, of which there are so many! It’s also wonderful to commune with fellow students and brethren from LA. Both Jim and Paul are inspiring artists, pedagogues, and people I’m proud to call studio mates. We’re rarely in the same place at the same time. Doing so to celebrate Alan, whose personality may eclipse us all, ensures Provo is in for a real treat! All events will take place at Brigham Young University and are free and open to the public. Please join us for this historic viola event. If you haven’t had a chance to take a tour of the Primrose International Viola Archive, don’t miss this opportunity! See you there! 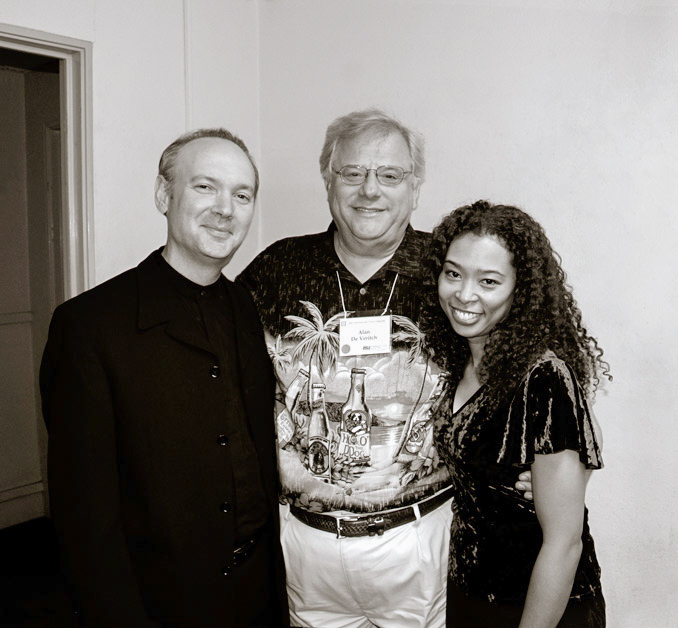 Alan de Veritch Tribute Concert, featuring James Dunham, Paul Neubauer, and Nokuthula Ngwenyama. The recital program features works that have a connection to Mr. de Veritch. For instance, Ms. Ngwenyama will perform a piece written by Mr. de Veritch’s grandfather, and Mr. Neubauer will perform a piece dedicated to Mr. de Veritch when he was still a teenager. The recital includes works by von Winterfeld, Nwgenyama, Dale, Benjamin, Mana-Zucca, Valdez, and Brahms. The viola ensemble arrangement of Zwei Gesange will be conducted by Alan de Veritch as part of this recital. 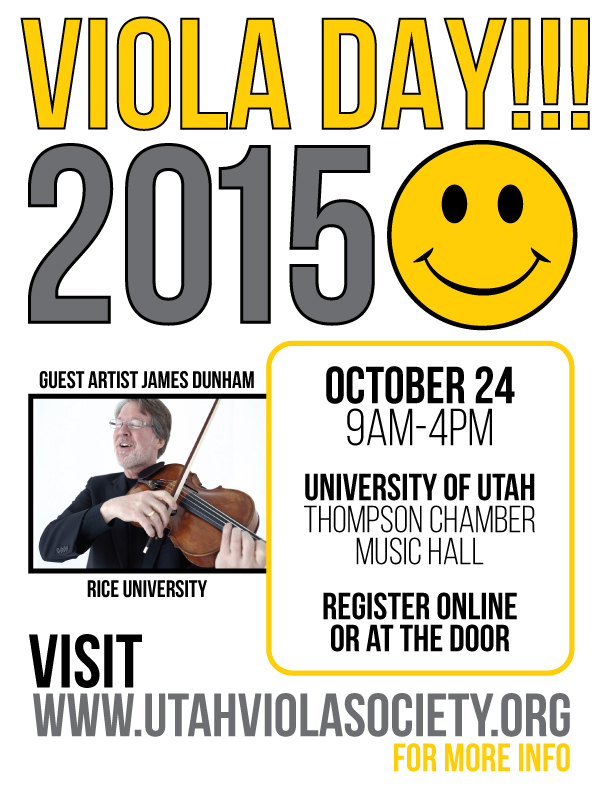 Save These Dates – Upcoming Utah Viola Events! Please mark your calendars, and help to spread the word: share this information with your students, colleagues, and friends. Looking forward to seeing you there, Viola Friends! September 21, 6-8 PM, University of Utah, Dumke Recital Hall. Masterclass with Guest Artist Nokuthula Ngwenyama. 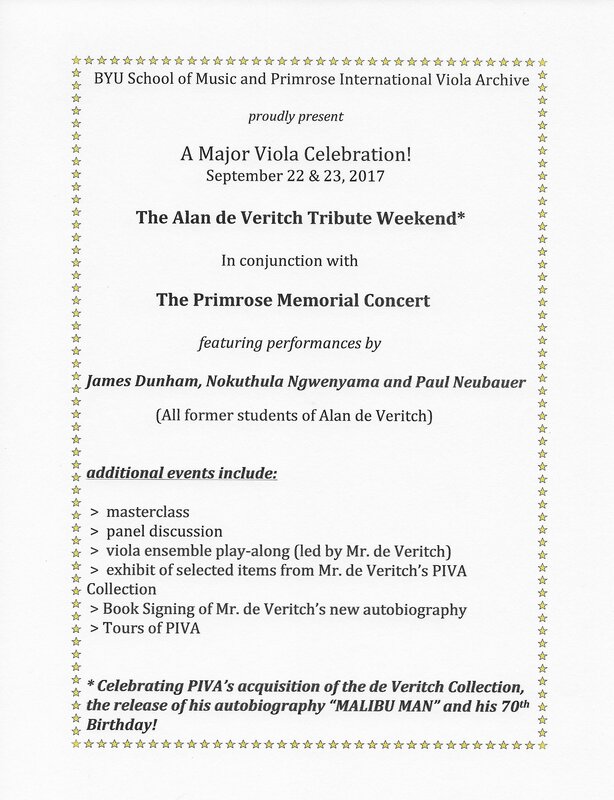 September 22 – 23, Brigham Young University, Alan de Veritch Tribute Weekend and Primrose Memorial Concert, featuring violists Nokuthula Ngwenyama, James Dunham, and Paul Neubauer. 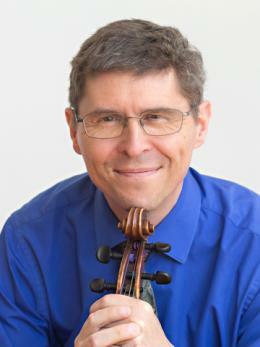 Utah Viola Society’s guest blogger this week is the fabulous violist James Dunham. (Many of you will remember that UVS President Brad Ottesen studied with Mr. Dunham, and he was our distinguished guest for Viola Day!!! 2015!) Mr. Dunham is Professor of Viola at Rice University’s Shepherd School of Music. He worked with Alan de Veritch later in his viola studies, and considers him a dear friend and mentor. You’ll have an opportunity to see Mr. Dunham pass on the knowledge that he learned from Mr. de Veritch as part of the Primrose Memorial Concert/Alan de Veritch Tribute events September 22-23, 2017 at Brigham Young University! “The path I took to studying with Alan de Veritch was not the usual one. As described in his just published autobiography “Malibu Man”, Alan was “the very first young virtuoso of the viola while still a teenager.” Unlike Alan, I was no young virtuoso of the viola nor, for that matter, of the violin! I was just a guy from a musical family who played violin with some success. It wasn’t until the viola discovered me that my thoughts turned to music as a lifetime profession! Once that decision was made, the result of a most wonderful summer at Tanglewood as a full Fellowship violist following my freshman year of Liberal Arts study, I made a seemingly surprise decision. I opted to transfer to the just-opening California Institute of the Arts, founded by Walt Disney on property north of Los Angeles in Valencia, California! I actually went out to study with the well known Curtis trained violist David Schwartz, longtime Professor of Viola at Yale University and violist of the Yale String Quartet. As I soon discovered, Mr. Schwartz was also one of the main violists in the New York free-lance scene, and his eyes were on Hollywood! I had 3 very successful years with Mr. Schwartz, from my Junior year of undergrad study through the first year of Masters work. By this time, David (as I was then allowed to call him, as per Southern California informality) had built his career into that of first-call violist in the flourishing L.A. studio scene of the 1970s. He left Cal-Arts, and my fellow students and I needed a teacher! Alan to the rescue. Young, charismatic, prize-winning, co-principal violist of the Los Angeles Philharmonic: what could be more perfect? He also lived IN Valencia, just down the hill from our school: ideal! So my final year of Masters study was with Alan de Veritch, just a few years older than I, but with a lifetime of difference in experience as a violist, performer and musician. And let’s not forget: pilot, flight instructor, businessman and real-estate expert! What changes did I encounter at the beginning of this relationship that soon grew into friendship? Interestingly, after receiving many years of very “correct” teaching, it was a big surprise to encounter someone with tremendous facility and the great imagination to look for solutions in surprising places. Colors, timings, and especially fingerings that need not be about convenience, but were all about character, quality, charm and, not infrequently: daring! It was a great and wonderful invitation, and of course, these were things I took to heart, learned to love and seek out, and continue to use and pursue today! As expected, I graduated on time after this final single year of “official” study, yet Alan continued to look after and mentor me. His dear friend (and later mine) Jan Hlinka, the elder co-principal in the Philharmonic, became ill and was out on sick leave for a month. Thanks to Alan, I was invited to fill out the back of the section for those four weeks. Talk about eye-opening! I had certainly played plenty of large orchestra in my life: two summers at the National Music Camp in Interlochen, Michigan plus two academic years at the Interlochen Arts Academy, and even two summers at Tanglewood. But this was very different, with multiple programs per week, truly limited rehearsal schedules, not to mention a busy life in every spare moment! By this time, the Sequoia String Quartet, of which I was founding violist, was well established, and we even had started a limited residency at Cal-Arts. I was also principal violist of Henri Temianka’s California Chamber Symphony and a section member of Neville Marriner’s L.A. Chamber Orchestra, with steady studio work coming my way, too. Even so, I still felt in need of “something.” Enter Alan again: William Primrose, his teacher and mentor, came to L.A. for a masterclass. As I was no longer a student, I was therefore ineligible to perform, so I pleaded for a private lesson with Mr. Primrose, which was granted. It lasted almost two hours and was life changing for me. Each question Mr. Primrose asked – “Can you do this?” – was followed by my reply: “Why…yes I can!” with a simultaneous and enormous “AHA” moment for me! At the end of our time together, Mr. Primrose suddenly looked startled and said: “I have told you too much at one time!” I protested, and he then instructed me to go home, write everything down, and come to Alan’s house that very evening so that he could confirm that I heard him correctly and understood all that he had shared. I still have these notes, and consult them on a regular basis! Pg. 301 from Malibu Man by Alan de Veritch This is about the time of my single, pivotal lesson with the great William Primrose! In the years to follow, Alan and I remained in touch on many levels: he as mentor to me, I occasionally as flying “partner” to him if he had to get in some hours flying around Southern California, or to Catalina Island and back. We even incorporated musical topics! As the years proceeded, I left California to join the Cleveland Quartet at the Eastman School of Music. Alan’s attention also moved eastward when he accepted the Professorship once belonging to William Primrose at the Indiana University School of Music. Still keeping me in the back of his mind, when IU sponsored the 1995 Viola Congress (just as the Cleveland Quartet made the difficult decision to disband) Alan called me and said I should really stay visible in the world of violists: “You must come to the Congress!” And he offered me several prominent roles to keep me front and center! Well, now many years later, he’s continuing his thoughtful caring for his former students, notably Nokuthula Ngwenyama, Paul Neubauer and me. On the surface, the upcoming event at the Primrose Archives at Brigham Young University is all about Alan, his career and legacy. But leave it to Alan to include us, both to shine some light on his pedagogical impact, and at the same time to salute the achievements of three of his protégés. If I may, in keeping with this time-line of history, I am also delighted to be returning to the Primrose Archives that I visited not long ago with my own former student, Bradley Ottesen. Now Associate Professor at Utah State University and violist of the Fry Street String Quartet, Brad is also President of the Utah Viola Society! So much to be proud of on all sides. A recent visit to the Primrose Archives with MY former student Brad Ottesen! Here we are with Archivist Myrna Layton and BYU Professor of Viola Dr. Claudine Bigelow. I eagerly look forward to the festivities at BYU in September. See you there!! In anticipation of this year’s Primrose Memorial Concert honoring Alan de Veritch, Utah Viola Society will be presenting visiting guest bloggers! This week’s guest contributor is the distinguished violist Paul Neubauer. As a young man, Mr. Neubauer worked with Alan de Veritch, and will be participating as a panelist, teacher, and featured performer at the Primrose Memorial Concert/Alan de Veritch Tribute events September 22-23, 2017 at Brigham Young University. “I first met Alan de Veritch because Alan’s father and my mother both taught at a school in the San Fernando Valley in Los Angeles. They became very good friends, and our families grew quite close. When I was 10 or 11, my godfather, Paul Doktor, suggested to my parents that it was time to leave my local viola teacher to study with Alan. I wasn’t keen on the idea since I really liked my teacher, but move on I did, and it was a great decision. I recall Alan’s teaching style as very confident and decisive – he always had a great deal to say. How much I absorbed at the time I’m not sure, but I am extremely grateful for the solid foundation that he instilled in my playing. I have memories of Alan trying to get me to work on scales, exercises and etudes. I must have done a considerable amount of work on these studies as I still have numerous study books by Flesh, Schradieck, Kreutzer, Campagnoli, Sevcik and others with various exercises marked for my attention. Alan worked with me on numerous pieces and his knowledge about the repertoire and Ysaye-Primrose pedigree was very helpful in my music education. After I left Los Angeles to study with Paul Doktor in New York, Alan was always available to offer his advice on any questions that I had, and there were occasions when I would return to play for him since his counsel was always appreciated. One of the most helpful couple weeks was when I was preparing for my New York Philharmonic audition. I had auditioned for Zubin Mehta to be a soloist with the orchestra and the word back from the Philharmonic was the question of whether I would have interest in auditioning for the Principal Viola chair. I had known that the orchestra was looking for a new principal but had never thought about it due to my lack of orchestral experience and not to mention my young age. With an invitation from the Philharmonic to take the audition, I of course was flattered and thought I would give it my best shot. I think I had 4 weeks’ notice to prepare for the audition. I was familiar with all the solo and chamber pieces that they wanted but was pretty much clueless on the very long list of excerpts that were asked for. I contacted Alan and he agreed to work intensively with me for a couple weeks during that time. His guidance (and knowledge of Zubin’s preferred way of approaching certain pieces) were incredibly helpful in my preparation for that audition and I think it’s fair to say that Alan had a tremendous amount to do with my being asked to join the orchestra. There were some amusing moments in our lessons that stand out in my mind. Alan was not happy with my strolling around the room when I played for him so he made me play for him while I was standing on a chair. Needless to say, it worked. (These days I have been known to stroll around audiences playing so he wasn’t entirely successful on this count!) Alan also complained about my high left thumb (courtesy of my first teacher) and claimed that he could throw horse shoes on it! Alan was not particularly happy that I would yawn in my lessons. My father took care of that by paying me 10 cents for every lesson that I didn’t yawn in. For a kid who didn’t have an allowance, this dime a week did the trick. If only I had invested those dimes in a wise way… Alan likes to remind me that I would come in and play show tunes instead of my assigned repertoire. This part is a bit hazy for me but I know that I did like to fool around by playing show tunes and any other tunes that I was interested in. I certainly learned a great deal of repertoire with Alan so it’s fair to say that I couldn’t have just played show tunes. Please join us for the Primrose/de Veritch weekend at BYU September 22-23, 2017!